1983 – It was an order by the U.S. Under Secretary of Defense, Richard DeLauer. 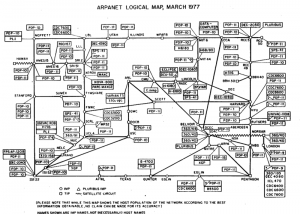 The ARPANET was to have finished a conversion from the Network Control Protocol it was on, to Transmission Control Protocol / Internet Protocol. Otherwise known as TCP/IP.The transistion went smooth, and everyone got a button for their hard work stating “I survived the TCP/IP transition”.